Flavour Shots are short descriptions of game artefacts and phenomena for use by Dungeon Masters, Game Masters and Storytellers in their games. Feel free to drag and drop these into your own games, and modify to suit. Let us know if you end up using them. Some will be portals to other realms, some will be magic items, others will be monster encounters. This time, it’s fifth Edition Dungeons & Dragons fighters and the techniques they can use to overcome opponents. A D&D skill contest can be used by everyone, but fighters benefit the most. Every combatant in a fight can do some interesting things to spice up the melee, but the fighter is notable for being the one able to make use of more of them in a round. A 20th-level fighter, regardless of martial archetype and Fighting Style, gets four attacks as part of their Attack action. Four! You could simply make those four swipes with a sword and be done with it, but wouldn’t you rather punch someone quickly in the face to blind them for a moment, getting advantage on your next attack where you soften them up enough for the wizard next to you (also with advantage thanks to you) to finish them off with a swift knock from their quarterstaff? Before your turn is over, you can run over to a pair of opponents and shove one against the wall with one hand, stopping them from moving, while giving the other a growl and an intimidating stare ensuring that if they do try to hit you while you take care of their friend it’ll be a feeble attempt. The Player’s Handbook for 5E D&D has wonderful sections throughout describing how a character can perform all sorts of incredible and interesting feats. Anything the human body can do, so it is your character can too. On page 195 of the PHB one can find three very interesting things. These interesting things are the Grappling rules, the Shoving a Creature rules, and the Contests In Combat sidebar; the latter provides insight into the creation of the former two, and provides us with the crux of our article here today. Next, we have Shoving a Creature: it presents the same option, forgoing one Attack roll the character receives for making an Attack action to instead make a contested skill check. The result, again, is the imposing of a condition, this time prone. Of course, this is where we get the second interesting mechanic, whereby we can swap the condition for a small movement of the target. The final piece of the puzzle is the sidebar. 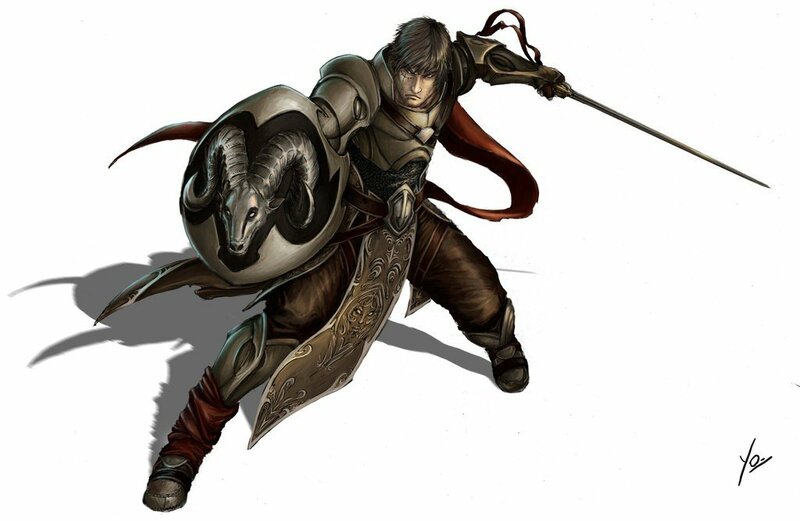 It states explicitly that the DM can use the Grappling and Shoving a Creature skill contests as examples for improvising others of their kind, creating contests in combat to provide an edge. I propose the following skill contest scenarios for use in D&D. Consider these Flavour Shots to improve the function, rather than just the story, of your games. When you want to gain a moment of surprise in the heat of battle and blind an opponent temporarily, you can use the Attack action to make a special melee attack to throw some nearby dirt into their eyes or violently poke them to make an opponent recoil. If you’re able to make multiple attacks with the Attack action, this attack replaces one of them. The target of your blinding attempt must be within your reach, you must know how it sees and you must be able to reach all their eyes. You make a Dexterity (Sleight of Hand) check contested by the target’s Strength (Athletics) or Dexterity (Acrobatics) check (the target chooses the ability to use). If you succeed, you subject the target to the blinded condition. The condition lasts until the beginning of your next turn, by which time the target has removed the sand from their eyes, lifted their bandana out of the way or otherwise cleared the condition without much effort. Clearing your vision. A creature blinded in this way can use its action to clear the mud or quickly rub their eyes better. Using the Attack action, you can make a special ranged attack that momentarily catches an opponent off guard and makes them emotionally vulnerable to you. If you’re able to make multiple attacks with the Attack action, this attack replaces one of them. The target of your charming attempt must be able to see or hear you, and must be capable of finding your attempts alluring; this usually entails being at least of the same creature type. You make a Charisma (Performance) check contested by the target’s Wisdom (Insight) or Charisma (Intimidation) check (the target chooses the ability to use). If you win the contest, the target suffers from the charmed condition until the beginning of your next turn. You have disadvantage on future attempts against this target for the next 24 hours. By using the Attack action to make a special melee attack, you can soundly whack the helm of an armoured soldier or scream loudly close to a goblin’s ear such that it makes it harder for them to clearly pick out noises around them for a few seconds. If you’re able to make multiple attacks with the Attack action, this attack replaces one of them. The target of your deafening attempt must be within your reach, you must know how it hears and you must be able to reach all their ears. You make a Strength (Athletics) check contested by the target’s Dexterity (Acrobatics) or Constitution save check (the target chooses the ability to use). If you successfully roll higher than the target, they gain the deafened condition until the beginning of your next turn. When you find a creature that seems skittish, you can make a special ranged attack using the Attack action to strike a momentary jump of fear into them. If you’re able to make multiple attacks with the Attack action, this attack replaces one of them. The target of your attempt to frighten them must be able to see or hear you. You make a Charisma (Intimidation) check contested by the target’s Wisdom (Insight) or Charisma (Intimidation) check (the target chooses the ability to use). If you succeed, the target now has the frightened condition. The effect lasts until the beginning of your next turn. Strength in numbers. If the target has an ally within 5 feet of either themselves or you that they can see or hear, you have disadvantage when making your Charisma (Intimidation) check. To complement and take advantage of these options, I would like to propose an additional Fighting Style to add to the feature presented to the fighter at 1st-level. Dirty fighting. You can take a bonus action on each of your rounds of combat. This action can be used only to perform attacks that involve a skill contest. Dig, if you will, the picture of a fighter utterly diminishing the tactical prowess of their opponents by knocking them prone and affecting their movement range, blinding them to impose disadvantages to their attacks, deafening them to help the rogue sneak up on them, and frightening lone goblins to make them less effective after their comrades have already fallen to the blade, all while still swinging a sword and generally helping out in combat. These skill contests need not only be the purview of the fighter and are in fact open to all characters, but the fighter truly gets the most utility out of them by being able to affect multiple opponents in a round and impose different conditions if need be. One will notice that a few conditions from the list in Appendix A are missing. This is because I feel they belong in a special sub-category of conditions that either involve another condition and so are more powerful than the others, or they describe a state that is unreasonable to achieve within six seconds using mortal and unaided means. Essentially Grappling and Shoving a Creature can be done naked, unarmed and unarmoured. You need no equipment to achieve it. Petrifying someone, however, isn’t something I can imagine myself being able to do without several years and a mineral-rich slow-drip waterfall. To that end, we have the list above. There are some seemingly simple ones that were left out because I really couldn’t see how they would work. Incapacitating an opponent seems far too powerful and I can’t imagine a scenario where unaided by items or magic, someone can remove someone’s ability to Dash, Attack and cast any sort of spell whatsoever but allow them to keep their movement. Restraining someone is basically a long-term grapple, etc. 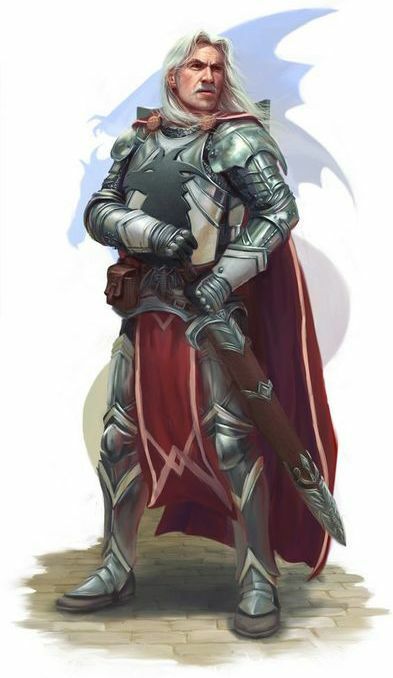 D&D is a fantastically versatile system when you set your mind to it, and the skill contests feel really suited for characters like the fighter. If you think you can make a good case for the others left off this list, fight me we can discuss it politely in the comments. I’ll certainly be adding these options to my games; speaking of which, I’m a professional GM as well as a writer here at Nerdarchy. Check out my pricing and enquire about booking a game over on my facebook page or on Looking For GM, and check out more useful videos on my own YouTube channel. I was recently interviewed about being a professional GM on Looking For GM’s podcast here. 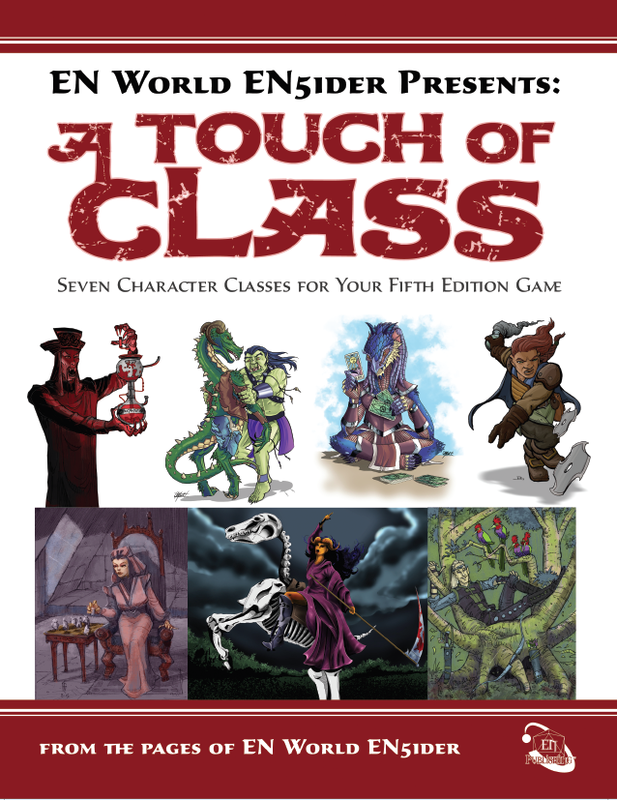 A Touch of Class is a 70-page book of new classes, feats and options for 5E. Be sure to check out the other Flavour Shots and find other fun stuff to add to your D&D game like class-specific scenarios and unique situations. If you’re looking for even more crunchy bits to add to your D&D game, check out A Touch of Class on DriveThruRPG. This book from EN Publishing, the publishing arm of EN World, contains seven new 5E classes. Once your cart is filled up, you can use Nerdarchy’s exclusive coupon code DTRPG-Nerdarchy to get a 10 percent discount on your order of $10 or more. (Discount available for digital products only.) This code works with any of the OneBookShelf sites, including the Dungeon Masters Guild. You might also find some useful stuff over at Frog God Games. They’ve got a whole category of GM/Player Aids like maps, random generators and lost lore waiting for your next game. Or just poke around here on our site! In addition to Flavour Shots there’s at least a bag of holding’s worth of unique content and ideas for your gaming needs. If you’ve got any creative ideas yearning to be shared, consider contacting us at submitting a post for publication. Above all else, whatever you do, stay nerdy!